Every once in a while I come across a recipe that's a little out of my comfort zone. Maybe it requires a tool I don't own, or a technique I've never tried, or maybe it just sounds like something a home cook can't make. 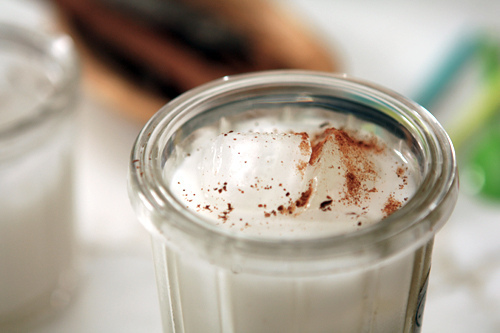 This horchata recipe is one of those. It doesn't sound too complicated, however it's different than any beverage I've made. But, what kind of life would I be living if I regularly gave in to the naysayer within? As Oscar Wilde said, "To live is the rarest thing in the world. Most people exist, that is all." So, I fully intend to be a liver, not an exister! I hope you're with me and that you'll make your own horchata! Okay... In the spirit of full disclosure, I must say that, while I have tasted the result of this recipe which is to. die. for., I haven't YET made it myself. But I'm going to tackle it this Summer! My good friend and fellow foodie, Nicki, made it for our Cinco de Mayo party, and it was the best horchata I've ever had. 2. Transfer the rice to a bowl then pour warm water over it and add the cinnamon stick. Cover and refrigerate at least eight hours, but preferably overnight. 3. Pluck out the cinnamon stick then puree the rice and water until it’s as smooth as possible. Strain the mixture through a sieve lined with a few layers of cheesecloth, squeezing it relatively firmly to extract as much of the rice flavor as possible. 4. Stir in the sugar and milk, mixing until the sugar is dissolved. Taste, and adjust sweetness, if necessary. Refrigerate until completely chilled. Serving: Serve over ice with a sprinkling of ground cinnamon on top. Storage: Store the horchata in the refrigerator for up to four days. Note: The original, and most other horchata recipes I’ve seen, recommend using long grain rice. However I used short grain rice, and was pleased with the results. In Spain they make horchata with chufa, which are not easy to find, depending on where you live.